I’ve published recipes for mashed potatoes before, but I just can’t stop, because truth be told, they are one of my favorite comfort foods. I make them all the time and everyone loves them (who wouldn’t love my cooking), but sometimes I want to take the humble mashed potato and make an elegant, upscale version. 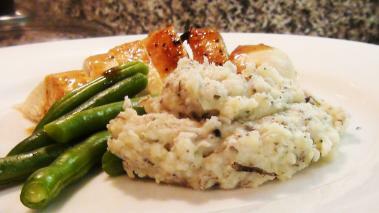 In this recipe, I show you a Truffle Mashed Potato that does just that. Truffles are pretty rare treat for me, reserved for special occasions, but on those occasions they are worth every penny. The aroma the truffle brings to the mashed potato is totally unique and absolutely delicious. So, if you’re ever looking to make an upscale comfort food, this is a great recipe for you. When cooking the potatoes, start them off in room temperature water. That will help make sure the potato is cooked all the way through, without getting over-cooked outsides.